Remember to use the search form (on your right) if you cannot find what you need! Height x Width: 4 in. x 15 in. 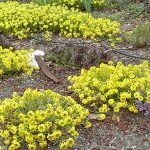 Mountain Alyssum is one of the earliest of the spring bloomers. Bright right yellow flowers over attractive, low gray-green mats of small oval leaves. Nice for rock gardens, front of borders. Pollinators: bees and butterflies. Can seed out. Height x Width: 1-2 ft. x 2-3 ft. Creeping Oregon Grape is a low-growing, evergreen shrub. Bright yellow flowers bloom in spring followed by blue berries. Leaves are evergreen. 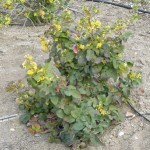 Adaptable to many soil types and does well in full sun or full shade. Nectar and pollen source for native bees. 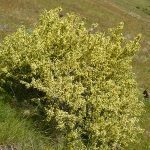 Height x Width: 5-6 ft. x 4-6 ft.
Bitterbrush is a highly branched native shrub often with spectacular yellow spring bloom. Could replace forsythia in native, xeric gardens. Good wildlife habitat. Pollinators: butterflies, bees. More info here. 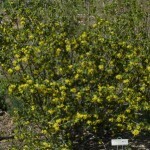 Golden Currant is a deciduous shrub with fragrant, golden yellow flowers in early spring. Small, bright green maple-like leaves with lovely fall color. Widespread in Boise foothills. Tolerates a wide variety of conditions. More information here. 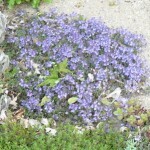 Wooly Veronica is a vigorous xeric ground-cover. Woolly evergreen foliage creates a handsome, dense gray-green carpet, covered in early spring with blue bell-like flowers. Does best in part shade, works well crawling under shrubs.